San Diego Whale Watching Coupons - See The Whales & Save! It’s easy to understand why whale watching excursions top the must-do lists of San Diego visitors. Spotting massive whales breaking the water surface with a huge splash, seeing them spouting as they surface and fluking as they dive back down again, is awesome. Whale watching tours offer the thrilling experience of seeing these magnificent marine giants up close and learn about them and their migratory habits, as well as spot other marine animals on the way out to the whale migrating lanes. Adding to the breathtaking whale encounter is the excitement of seeing pods of speedy dolphin swim by. The whale species sighted off the coast of southern California changes from summer to winter. To make the most of your whale watching experience, it’s helpful to understand which whales you might see depending on the timing of your visit. In winter and early spring, the Gray whale is usually seen as it migrates between its summer feeding grounds in the Arctic seas to its breeding grounds in the warm waters off Mexico. Super-thrilling during April through May, is the possible sighting of Gray whale mothers and their calves making their way back home to the cold seas. In summer months, from the end of June to September, Blue whales, the largest creatures to have ever lived on earth, larger even than dinosaurs, migrate through the waters of southern California from the feeding grounds in the Gulf of Alaska to Costa Rica, where they breed and bear their calves. Humpback whales, the ones we associate with aerial acrobatics, can spotted throughout the year feeding on krill and small schooling fish. Dolphin, marine mammals who, as part of the Cetacean family, are kin to whales, can be seen year-round. Due to TV appearances, presence in Aquariums, and high visibility swimming along coastlines, the Bottlenose dolphin is the most familiar. Others include the acrobatic, playful Pacific White-sided Dolphin, Risso Dolphin, distinguished by its blunt head and round body, and the one most sighted, the super-fast Common dolphin. 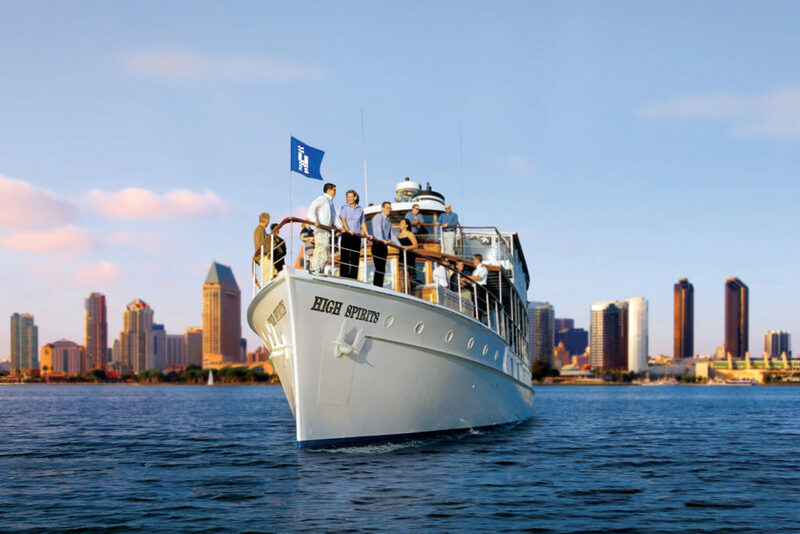 If you choose to purchase a Go San Diego Card, Newport Landing Whale Watching Cruise is also included. 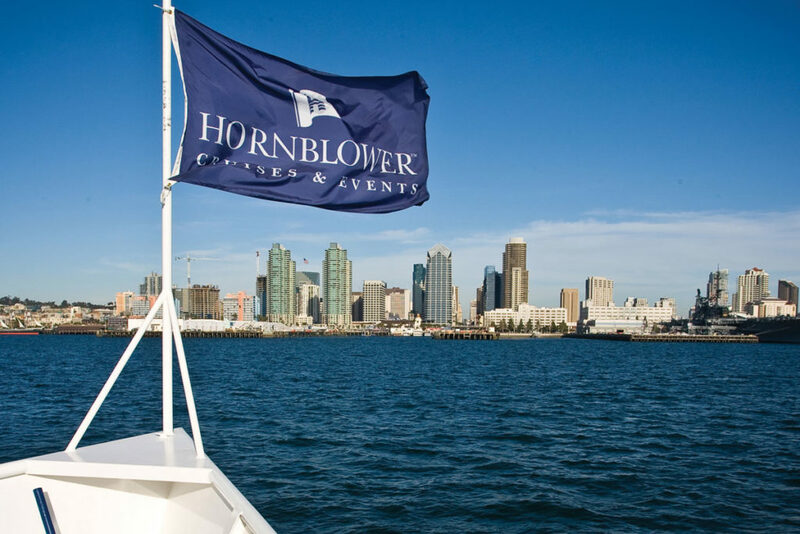 If your time is limited during a busy summer vacation in San Diego, plan to go on Hornblower’s 4-hour Summer Whale & Dolphin Watch Adventure in search of gigantic Blue whale. Departing at 9am from San Diego’s downtown harborfront, and returning at 1pm, it’s convenient. On the way offshore, settle into the comfort of a large yacht with both indoor seating and ample outdoor decks. There’s plenty to see: pods of dolphin, barking sea lions and lots of sea birds – all pointed out and explained by on-board naturalists. There are drinks and snacks to buy onboard. Pick from exciting cruises Friday, Saturday, Sunday and Monday, from the end of June until the first week in September. If you are a winter visitor to San Diego from December through April, Hornblower’s San Diego Winter Morning Whale Watching Cruise and Winter Afternoon Whale Watching Cruise are on a 3.5 hour quest at find Gray whales. The ability to pick morning or afternoon cruises, large indoor space, plenty of outside decks, interesting on-board narration, snacks and drinks make this a comfortable and convenient once-in-a lifetime experience. 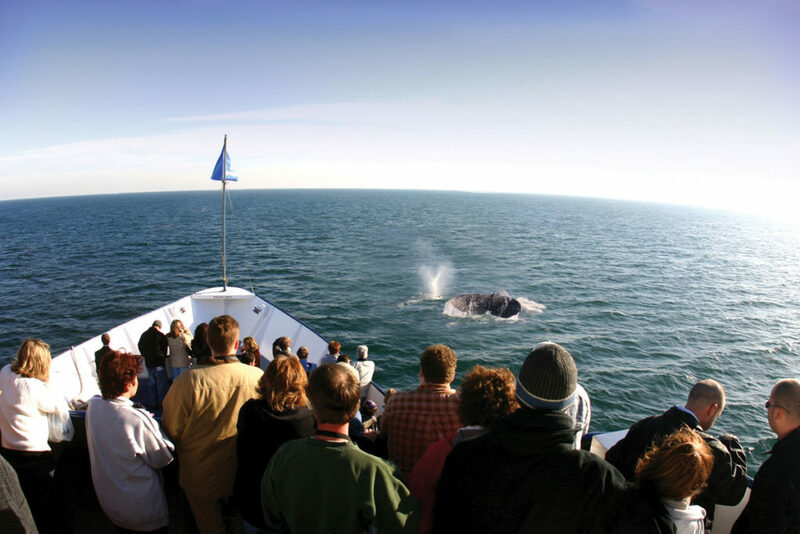 Year-round, if you have a full day and want to experience whale watching in a more adventurous way, drive 2.5 hours north to coastal Newport Beach to go on a Newport Landing Whale Watching Cruise. Several times a day, a fleet of smaller vessels, each around 75 feet long with open, walk-around outdoor decks designed for up-close whale watching, head out to one of the largest marine sanctuaries in California, located only a short distance offshore. The waters of this large, 15 mile long marine sanctuary have a rich marine environment, making it productive for sighting whales and dolphin. Depending on the time of year and luck, spot Blue whales, Humpback whales, Gray whales, Finback whales, Risso dolphin, Bottlenose dolphin, common dolphin, white- sided dolphin and more.